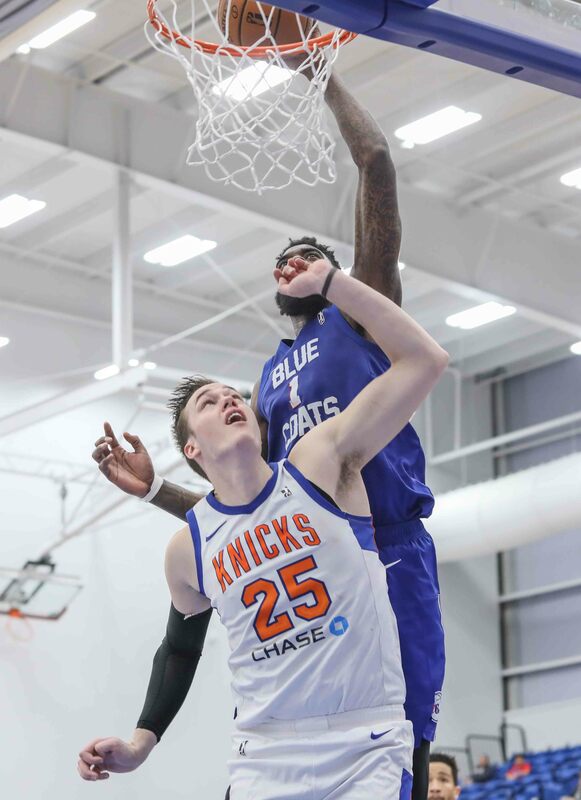 NEW YORK: April 3, 2019, The NBA G League announced that Delaware Bluecoats Norvel Pelle was named to the 2018-19 NBA G League All-Defensive Team. Pelle receives the honor after finishing third in the voting for both NBA G League Defensive Player of the Year and Most Improved Player last week. Joining Pelle on the 2018-19 NBA G League All-Defensive Team are Kadeem Allen (Westchester Knicks), Chris Boucher (Raptors 905), Amida Brimah (Austin Spurs) and Gary Payton II (Rio Grande Valley Vipers). In 36 games for the Blue Coats this season, Pelle averaged 11.1 points, 8.3 rebounds and 2.9 blocked shots in 22.8 minutes per game. His 2.9 blocks per game placed him second in the G League, and his 104 total blocks were the third-highest mark in the category. Pelle also ranked second in the league in blocks per 100 possessions (5.8). The 26-year-old Pelle recorded his season-high seven blocks on three occasions (March 4 vs. Fort Wayne, March 9 vs. Grand Rapids and March 11 vs. Westchester) and blocked multiple shots in 27 overall contests. In a victory over Westchester on March 11, Pelle posted a career-high 22 rebounds, 19 of which came on the defensive glass. This season was Pelle’s third season with Delaware, having previously played in 39 games from 2013 to 2015, averaging 5.5 points, 3.1 rebounds and 1.5 blocks in 12.8 minutes per game.